While taking care of any Bonsai tree there are a few unexpected downsides that you will have to keep away from so as to maintain the health of the bonsai. Given below are some troubles that are experienced while taking care of a bonsai and also the ways to overcome them. Based on whether your bonsai tree is broad leafed or not will let you decide if you must let its leaves naturally shed during autumn or not. In case your bonsai is an Evergreen tree then your bonsai will have leaves throughout the year. If you are worried then check the color of the leaves. If the leaves appear yellow and are very delicate then it suggests lack of water. But if you notice that the leaves are yellow and dropping all the time, it signifies excess watering. The Bonsai tree must be watered on regular basis considering the surroundings where it is placed. One must by no means allow the bonsai to get dried out and dehydrated. In the same way watering the bonsai tree in excess is also very bad. Thus there must be sufficient holes in the bottom of the bonsai container in order to drain out the surplus water and also so that the roots do not decay and get delicate. In order to skip such problems see that you water your bonsai a little daily. Therefore, normally the soil must be wet and by no means dry or waterlogged. Always see that the bonsai pot is capable to fit the size of your tree. It is not necessary to use only those exclusive Bonsai pots. But make sure that the Size of the pot is satisfactory to fit your bonsai tree. Try to avoid the pots that are glossy and shinny from the inside as they are not best suited for growing bonsai trees. 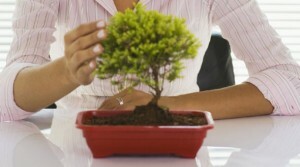 Never hesitate to trim the Bonsai tree whenever you feel you want to shape it. The skill of Bonsai all rest in trimming. Before trimming the Bonsai just make certain that there is enough fresh growth. The unwanted branches have to be nipped to the bud using sharp pair of scissors. The fresh branches will then catch the angle the bud is facing. Thus by doing this you can get your desired shape. Remember that the skill of bonsai is to imitate the look of the natural tree but on a miniature level. Never make your bonsai look very unusual.